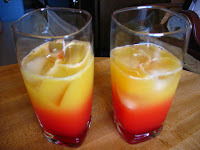 The Tequila Sunrise is an easy drink to make. It contains only three ingredients (orange juice, tequila and grenadine), and it requires none of the annoying labors typically involved in making tropical-style drinks--like crushing ice, using a blender, or cutting up pieces of fruit. Heck, you don’t even need a purple umbrella. Pour orange juice into a highball glass filled with ice cubes. Add tequila. 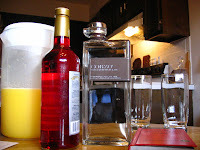 Then gently add grenadine, letting it settle on the bottom of the glass. Since it was Laura’s birthday just a few weeks ago, and since she received a gift of two kinds of fancy white tequila from me (no it was not a Homer gift! ), we’ve been lingering in the tequila section lately. Most people have what we’ll euphemistically call “a tequila story.” We have one friend, now nearly 20 years removed from his tequila story, who still can’t sit in the same room with a bottle of the stuff. What a tragedy. Do you drink/eat the worm????? I like to eat it with CHOCOLATE!!! !